From growth hacking to long days with more caffeine than sleep, startups are all about doing a lot with little resources. So when SXSW Interactive is only an hour away from Filestack’s home base in San Antonio, I couldn’t afford a ticket, but I also couldn’t afford to miss out on all of the tech enthusiasts, entrepreneurs, and industry experts in my neighborhood. So I googled some tips, drove up my car, and just went for it. Here are my notes from Interwebs and my own experience on how to have a fun, productive SXSW representing your startup, without breaking your marketing budget. Badges are expensive. Free events are, well, free. And they are easily findable via Eventbrite. Every so often, starting about 6 weeks before SXSW starts, just go on Eventbrite, search “SXSW,” filter for “free,” and RSVP to everything that looks interesting. 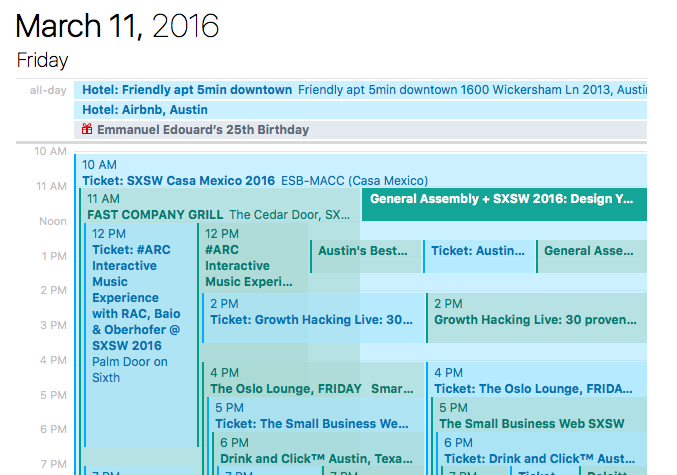 This may result in your calendar looking like this – but will also ensure that there is never a dull moment during the week. Day 1 of SXSW Interactive – Never a dull moment! Some of the free events are really great. There are lectures, meetups, happy hours, and shows – all great opportunities to meet entrepreneurs and startup enthusiasts. I’d recommend looking for the sponsors who are gathering the crowd you are interested in meeting – and hit up their events. Some of my favorite events included Casa San Antonio, Tech.Co’s Startup Night, The Small Business Web, and a Growth Hacking talk at the Capital Factory by Vincent Dignan. If you’re like me, you find extremely difficult to just go up to strangers and start talking about your company. You don’t want to come off as pushy or sales-y, and you’d rather make friends than bother people. But no one is going to know about your cool product until you tell them about it, so you have to just bite the pepper and start approaching people. Here’s my trick – go up to people wearing matching shirts, and ask them what their company does. If they are wearing matching shirts, they’re probably there to represent a company, and are thrilled that you opened up the conversation for them. Then, once the conversation is going, it’s easy to bring up yours. And if you’re there for a B2B startup, you’re already set up to explain how your product can help them. Me (Filestack) – “Oh cool! Do you guys do a lot of image uploading? I actually work at a company that handles image uploading and management for websites. Me (Filestack) – “Well we can’t do much to improve the quality of the image after it’s been uploaded, but we do allow you to set restrictions so your users are only allowed to upload whatever quality of image you specify in advance. So one conversation at a time is alright, but you’d rather pitch your product to a whole room full of eager potential customers and investors. However, you don’t want to pay a fortune to rent out a space, and you don’t even know how to get a bunch of good prospects into a room anyway. Have no fear! There’s a solution. Seed Sumo builds the crowd, and allows anyone to pitch their idea. The caveat? You have eat a habanero pepper before you can give your pitch. 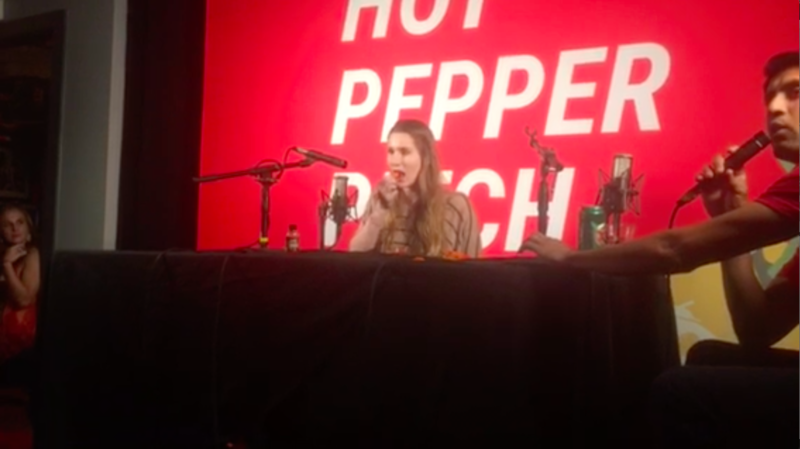 So if you can eat the pepper, and make it through your pitch without crying or vomiting too much, then you have a whole 2 minutes of captivated attention. And then a YouTube video to follow. Just eat the habanero pepper and talk about your product, they said. It will be fun, they said. There are 5 days of SXSW Interactive, which means a ton of amazing free events, opportunities to meet new people and learn about new products, and chances to stumble upon weird events that pull you on stage to do something embarrassing and/or painful. As long as you continue to attend free events, meet-up breakfasts, social lunches, and happy hours, you will find that you naturally spend less money than you originally anticipate. SXSW is a gathering of brilliant people from around the world who all come with stories to tell – don’t let lack of formal funding keep you from joining in on the excitement. You will leave Austin inspired and hungry – ready to take on all of the challenges to come.